Wilmington, NC - Kim Hufham, President/CEO of the New Hanover County Tourism Development Authority (TDA), announced the 2017 appointments and officers to serve on the TDA Board of Directors. Appointments to the TDA Board are made by the New Hanover County Commissioners. Officers were elected at the TDA regular board meeting, held on January 25, 2017. New Hanover County Commissioner Patricia Kusek has been appointed to serve on the TDA Board as the New Hanover County Commissioner representative. Peggy Sloan, director of the North Carolina Aquarium at Fort Fisher, was appointed to represent New Hanover County Attractions. Jason Spencer Bryant, general manager of Bryant Real Estate, was appointed to represent New Hanover County Vacation Rental Properties (100+ units). Nicolas Montoya, general manager of the Blockade Runner Resort, was reappointed to represent Wrightsville Beach Accommodations. Nicolas Montoya, general manager of the Blockade Runner Resort, was elected to serve as Board chairman. Angela Rhodes, co-owner of Catch Modern Seafood Cuisine, was elected to serve as Board vice-chairman. Daniel Perkins, assistant general manager of the Hilton Wilmington Riverside, was elected to serve as Board secretary. Lisa Wurtzbacher, New Hanover County Finance Officer, will serve as treasurer of the authority as directed by the enabling legislation (HB 1707). 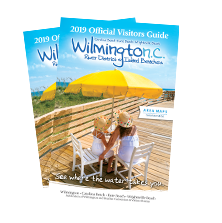 The New Hanover County Tourism Development Authority d/b/a Wilmington and Beaches Convention and Visitors Bureau is the official destination marketing organization which stimulates economic development through the promotion of travel and tourism.